Duodenoscopes are medical instruments used to perform a diagnostic procedure called endoscopic retrograde cholangio-pancreatography (ERCP). 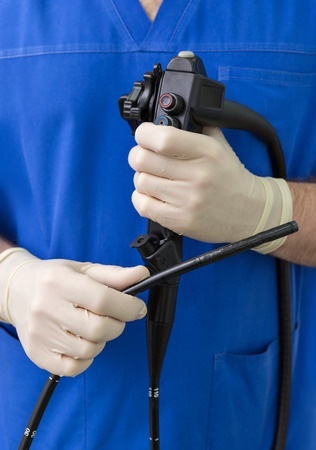 While complications from ERCP are rare, a number of hospitals have recently reported dangerous multidrug-resistant bacterial infections that likely originated with contaminated duodenoscopes. During ERCP, a duodenoscope is inserted into a patient’s mouth and guided through the esophagus, stomach and duodenum. It then transmits digital video images to a TV screen. Contras dye is injected through an open channel of the scope and X-rays are taken of the bile ducts and the pancreatic duct. The duodenoscope’s open channel also allows instruments to be passed through in order to perform biopsies, relieve obstructions of the bile ducts or pancreas, and to create incisions via electrocautery. For best results, ERCP should be performed on an empty stomach. Prior to the procedure, the patient will be administered IV medications to cause relaxation and sleepiness, and possibly a local anesthetic to decrease the gag reflex. During ERCP, the patient will be in a semi-conscious state, and will still be able to follow instructions to change body position on the X-ray table. The procedure can last anywhere from fifteen minutes to one hour. Irregular heart beat or heart attack. Recently, bacterial infections have come to be recognized as serious and potentially deadly duodenoscope complications. February 2015: The S. Food & Drug Administration (FDA) warned that the complex design of duodenoscopes can impede efforts to clean, disinfect or sterilize reusable devices. From January 2013 through December 2014, the agency received 75 reports of possible microbial transmission from reprocessed duodenoscopes involving 135 patients. However, it is possible that additional cases occurred but were not reported to the FDA.